Stolen (formerly Stolen Lives), a mystery-thriller about a father (Hamm) trying to figure out what happened to his young son, has been sitting on the shelf for a while (the trailer was out months ago), but is finally coming out. IFC will release the film on OnDemand on March 3 and in theaters on March 12. 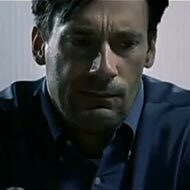 This is notable because it’s the first movie to capitalize on Hamm’s Mad Men fame by casting him in a leading role (though his fans are probably more excited for Hamm’s part in the higher-profile Ben Affleck Boston-cop flick The Town). The trailer, which has a Changeling feel, after the jump.